I tend to think of music and especially the search for records as a hobby, something that’s slightly independent from the rest of my life, even if I’m aware that the personal experiences I have with records (where, when and with who I hear a tune, for example) influence the way I listen to music. However, there are times when the permeability between what I try to keep as two distinct spheres in my life strikes me in an unexpected way. This is the case of Lou Blic‘s record and poetry book, Il y a moins de monde là-haut. It all started when I found out that Lou Blic (pen name of Yves Boullic) was the husband of a teacher I had at University, Corinne Lellouche. Born and raised in the same little town on the Atlantique coast than me, Yves Boullic moved to Paris in 1982, after spending some time in Nantes. The Nantes years were the time when he met and connected with what would become influential musicians from the alternative scene in Bretagne – people that achieved both critical and commercial success with groups like Marquis de Sade or Marc Seberg, including saxophonist Philippe de Lacroix-Herpin – while he was investing himself in various bands and cultural projects. During his studies in Paris, Yves Boullic met his future wife and associate, Corinne Lellouche, as the two of them would found their own publishing house, Les éditions de la rue de l’ouest. At 30 – and after a successful career in communication – Yves Boullic parts with professional world, to become a full-time poet. Yves Boullic becomes Lou Blic. In the meantime, Corinne Lellouche writes her first book, Ma vie est une oeuvre d’art. The two of them decide to publish it via their publishing house, rather than to have the book modified by another publisher. In order to have journalists speaking about it, they decide that it will feature 4 pages of advertisement. It works and the book sells well. The money freshly brought in the publishing house’s treasury by Corinne Lellouche‘s book allows Lou Blic to publish Il y a moins de monde là-haut, and also to take up with music. He gets in touch with Philippe de Lacroix-Herpin, hires him as well as Mireille Pombo (who sings on the song Juliette et Roméo), pays for a full day in studio and records his only record, Miaou petit minou. The record is « sold » alongside the book, hidden behind the cover and features three of Lou Blic‘s poems turned into songs. Till his death in 1995, Lou Blic never ceased to write poetry. Unfortunately, the three songs on the 7″ featured in Il y a moins de monde là-haut remain the only songs ever released by Yves Boullic. 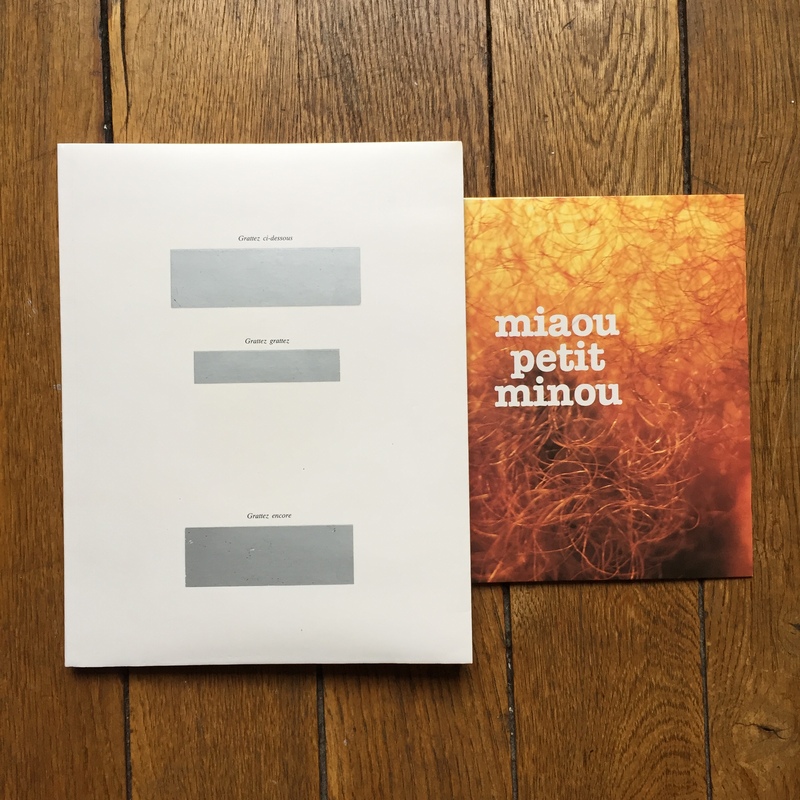 Recorded at the very beginning of the 1990’s, Minéralité illustrates a shift taken by music production during this decade towards something brighter, silkier that would really define the sound of pop productions in the 1990’s. From the recording of the voice to the soft synth pads and, of course the kind of « tribal » vocal samples, many elements departed from the sound of Parisian studios from the 1980’s. Historically, it is also one of the very last 7″ pressed in France, before the reign of CD’s. Many thanks to Corinne Lellouche for recalling their story for me.